Sales Overview - The primary page of the Bookkeeping module. This report displays and gathers all of the produced formal accounting documents. For further information, please read the next section. Cash & Cheque - Manage the cash and the safe, as well as the cheques of the business. For further information click here. Bookkeeping Entries - View, create and modify the bookkeeping entries. This tool is used by the accounts manager to manage all of the accounts of Hyper: Inner accounts, Clients, Suppliers and Projects. For further information click here. Toolbox - The Tool Box of Hyper was designed to provide the accounts manager with the following necessary and common tools: Import bank statement as entries, Feed in supplier invoice, Foreign currencies sync and settings, Auto charging and Auto billing. For further information click here. Stock Entries - Manage the stock entries of the organization. For further information click here. Reports - This tab gathers all of the required reports of the sales, bookkeeping, stocks and legislative / tax / public authorities. Inner Accounts - Create and manage the inner accounts and the balance of the organization. For further information click here. 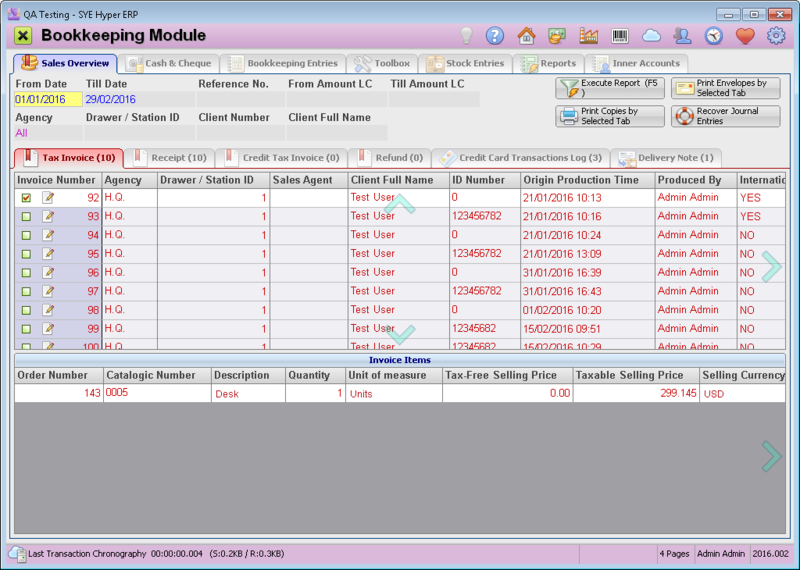 The sales overview is the main page of the bookkeeping module. This report gathers all of the produced formal accounting documents, displays the required information for each document and allows to open the client / supplier card of any selected document to view its details and to fill in the missing fields. Each sub-tab displays a table with the produced documents, according to the required filters. The filter fields - These fields are used for filtering the documents according to dates / Reference No. / Amount / Client details. The results tables - According to the definitions of the filter fields, the tables will display the required produced documents. The title of each tab also presents the number of displayed documents. Items list table - This table displays the items of the selected document. Additional information fields can be added according to the users needs. From Date / Till Date The time frame of the required documents production. As default the system displays the documents of the current month. Reference No. The system will display only the documents with the selected reference number. From Amount LC / Till Amount LC Define an amount frame for the required documents. Agency Display the documents from the selected agency. Drawer / Station ID Display all the documents of the required Drawer /Station. Client Number / Client Full Name Display the documents of the required client. After choosing the required filters, press the Execute Report (F5) button. The report is displayed in the following sub-tabs: Tax Invoice, Receipt, Credit Tax Invoice, Refund, Credit Card Transactions Log, Delivery Note. In each of the documents tabs there are two displayed tables: the first displays the documents and their details and the second displays additional information about the selected document's record. Additional information fields can be added according to the users and organization's needs and requirements. Double click on a document record in order to open its client card of Hyper. The icon is used for filling in the missing fields of a document. Click this icon to open the "Fix / Complete Official Document Fields Data" and fill in the required fields as described below. This table displays all of the tax invoices according to the selected filters. The Invoice Items table displays the items of the selected Tax Invoice and a relevant information fields about this invoice. This window allows to complete and fix some of the Tax Invoices fields. The primary fields of the produced documents can not be modified since these are an official documents. The modified fields (e.g. Sales agent, Internal Notes) will be changed accordingly in the client's card. This table displays the produced Receipts, according to the selected filters. The Receipt Items table displays the payment method and the details of the selected Receipt record. This option is used according to the organization policy and is usually used by "Banking Services Providers" and "Broker / Trading platform Providers" to update the details according to the local rules and regulations. Verify the relevant details and fill in the missing required fields. Use this button to search for the required bank from the banks index and automatically fill its details. Use this buttons to scan a document or upload a file. Verify the account details as well as the Reg. No. of endorsements of the cheque. This table displays all of the produced Credit tax invoices, according to the selected filters. The Invoice Items table displays the Tax invoice details, the order details and its items. This window allows to complete and fix some of the Tax Invoices fields. The primary fields of the produced documents can not be modified since these are an official documents. The modified fields (e.g. Internal Notes) will be changed accordingly in the client's card. This table displays all of the given refunds, according to the selected filters. The Refund Items table displays the selected refund method and its details. This table display the credit card transactions. Next to the Req ID, the icon will be displayed for successful transaction, the icon will be displayed if any error occurs and the icon for a failed transaction. Use the mouse and point these icons to view the transaction results text. Additional information is displayed at the bottom of the table. This tab displays all of the produced delivery notes, according to the required filters. The Delivery Items table displays the items of the selected delivery note. Print Envelopes by Selected Tabs Hyper allows to print the details of the the formal documents addressee on an envelope in order to send it by mail. Only one envelope will be printed for an addressee with several documents. The client's name and address will be printed according to the details in the client card. Please note - only the documents of the selected tab will be printed. Print Copies by Selected Tabs Use this button to view and print the certified copies of the selected documents. Please note - only the documents of the selected tab will be printed. Use the Recover Journal Entries button to recover entries that were not created due to any malfunction or connection error. The system checks whether there are any formal documents in the selected time-frame with no related bookkeeping entries, and creates the missing entries. In order to define the envelopes printer, open the "Countries & Logo" tab of the System Fundamentals.